The following information is also included as part of the Occupancy Agreement when booking a reservation. Check-in time is 3:00 p.m. or later. Check-out time is 11:00 a.m. or earlier. Key and directions, including a map, will be packaged and ready at our office located at 54280 N. Circle Dr, when you check in. Directions to your home will be highlighted on the map. Should you arrive after office hours, arrangements will be made in advance for pick up of your packet, if we have to stay later than 6:00 pm to wait for your arrival you will be charged a $50.00 late check in fee. Please call the office if you are going to be late to avoid an additional charge. Please drop the keys and Comment Form through the office door on your departure. Keys not returned are subject to a re-keying charge. The Cleaning Fee is non refundable. It ensures that the home you reserved is properly opened and prepared for your visit, that it is clean, the beds are made up with fresh linens, and each bathroom is stocked with bath towels, hand towels, face cloths, and bath mats. A bundle of firewood, starter and kindling will be placed on the hearth during the winter months, plus various other complimentary amenities. Because we will clean the house after your departure, your visit can be enjoyed to the moment of check out. Do not make the beds! Leave the cleaning to us although we ask that you do clean your dishes! The booking fee is varies from $50.00 to $175.00. All cancellations must be submitted to Idyllwild Vacation Rentals in writing 30 days prior to your arrival date or 60 days prior for holiday reservations. A $100.00 fee is charged on ALL cancellations. In the event of a late cancellation or cancellation made in less than 30 days, no refund will be made and you are liable for the total rental amount unless we are able to rent the property for the same time period to another party. We know you will leave the house in a reasonably clean and orderly manner to avoid additional charges and/or ensure a total refund of your security deposit. Any unusual mess or damage will incur an additional charge. Please leave hot coals or ashes in the fireplace or BBQ and we will dispose of them. If you need to remove hot ashes at any time, please be sure to use metal containers provided and set the container outside on the ground in an area cleared of pine needles and/or other flammable debris. Please do NOT set any container, including BBQ’s, filled with hot coals or ashes on the deck! For dire emergencies CALL 911 (accident, fire, intruders, flooding, etc). For minor emergencies and repairs, please contact our office as soon as possible at 951-659-5015. If after office hours, call 951-692-0777, leave a detailed message including your home phone number and we will be automatically paged. If you are happy with our services, tell all your friends. For every reservation referred by you, you will receive a $50 gift certificate on your next reservation. We are not responsible for retrieving forgotten articles. However, we will be happy to accommodate you in this regard for a minimum charge of $20.00 to retrieve, package and return any items to you. An additional fee may apply for overnight or express delivery. Bed linens consisting of sheets, pillow cases and blankets with the beds made up and ready for your arrival. Towels consisting of bath towels, hand towels, face cloths, bath mats and kitchen towels. Paper products including facial tissue, toilet tissue and paper towels. Complimentary products including high quality soap, shampoo, conditioner and moisturizer. If you desire an additional supply of any of the above products, a fee will be charged and they can be picked up at the office. For information regarding the cost and scheduling linen changes or extra cleaning during your stay, please see “Guest Services”. The home you reserved is equipped with all basic necessities. All you need to bring are your personal items and food supplies. Even grocery purchases can be arranged for in advance. See “Guest Services”. Monday thru Friday 9:00 a.m. to 6:00 p.m.
Saturday and Sunday 9:00 a.m. to 6:00 p.m.
Down Payment: To confirm your reservation, a Down Payment of 40 percent (40%) of the total amount must be RECEIVED at the time your reservation is booked. Total Payment: The total payment must be received thirty (30) days prior to your arrival. Overnight Delivery: To ensure delivery of your payment prior to your arrival, you may use Federal Express to: 54245 N. Circle Dr., Idyllwild, CA 92549 or Postal Express to P. O. Box 222, Idyllwild, CA 92549. Last Minute Reservations: A reservation is considered “Last Minute” if it is booked within thirty (30) days of your arrival. Last minute reservations will be accepted only if a Credit Card can be used for the total amount of the reservation. Returned Checks: Checks returned by the bank for any reason are subject to a $25.00 service charge. Credit Cards: We accept Visa, MasterCard, Discover and Debit Cards. Pets are allowed in some homes with prior approval, and are subject to a NON-REFUNDABLE fee of $25.00 per pet. You are responsible to pick up and properly disposes of all pet waste. Rates are subject to change without notice. 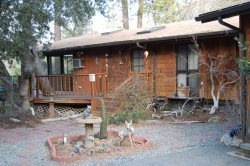 Please check rates in “Cabins/Homes Rental Search” or call Idyllwild Vacation Rentals to confirm all current rental rates. A security deposit is required on all properties in lieu of the Accidental Rental Damage Insurance. Guest agrees to be responsible for any and all damages to the unit, its contents and grounds during the rental period. If there are problems with the unit as a result of Guest’s actions or inactions, a full accounting will be made to the guest and an amount necessary to cover the problems will be deducted from the security deposit. Please allow three to five weeks for the security to be refunded. “NO SMOKING” is a requirement in ALL homes. We greatly appreciate your cooperation, if smoking outside, by appropriately disposing of cigarette butts, cigars, etc. Please DO NOT toss them onto the ground, or into flowerpots or shrubbery. Pine needles and forest debris can easily catch fire. You will be held responsible. Please be considerate by smoking at least twenty (20) feet away from any house entrance or window. Snow plowing is provided by the owner on some properties only. Snow plowing means that an attempt will be made to clear sufficient space to allow parking “off-street”. In any event, and especially in houses with long driveways, you may need to walk through the snow to your cabin. No refunds will be considered for inaccessibility to the cabin due to snow. NOTE: Be sure to check with our office concerning accessibility in winter to the home you reserved. Please also check with the U.S. Forest Service at 951-659-2117, the Highway Patrol at 951-845-4661, or Cal Trans at 1-800-427-7623 for weather conditions and snow chain or 4WD vehicle requirements. Telephone service is available in most cabins. Local calls are free. Our vacation homes now have long distance blocking. The use of cellular phones is available from most areas in Idyllwild. We highly recommend you use your cell phone or calling card for long distance calls. A ten percent (10%) Transient Occupancy Tax (Bed Tax) is collected on all reservations as required by Riverside County, California law. Idyllwild Vacation Rentals will dispose of your trash (up to 3 large bags) free of charge. However, It MUST be properly bagged and tied and left inside the cabin. If trash is left outside, it will be torn apart by raccoons or other animals and a fee to clean it up will be charged. Additional charges are as follows: 1) $10.00 for more than 3 bags, 2) $25.00 minimum for groups, weddings, receptions, etc., 3) $15.00 for disposal of Christmas tree. For the convenience of our guests, trash can be dropped off at Idyllwild Vacation Rentals office at any time and placed in the designated area. Although the information presented in the description of the homes has been carefully researched and is as accurate as possible, Idyllwild Vacation Rentals, and the cabin owners are not responsible for any changes which may occur. It is wise to verify the information and amenities immediately prior to your visit. Please visit our office or tour each home by visiting our web site at www.idyllvacationrentals.com .